GainJet sind ein griechisches Unternehmen, welches offenbar Business-Jets für Kontrakte anbietet. Weitere Informationen stehen mir nicht zur Verfügung. Im Oktober 2010 wird bekannt, dass die ebenfalls griechische "Amjet Executive" die einzige MD-83 übernommen hat. GainJet is a VVIP aircraft charter, management and sales company, with its headquarters based in Athens, Greece. 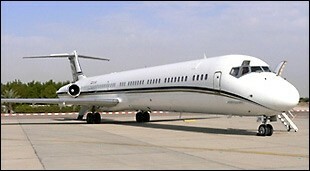 Thecompany started operations with one long-range luxury Boeing MD-83 aircraft. Introduction of additional aircraft is expected in the third quarter of 2006. We hold a worldwide JAR-OPS-1 (AOC) and we strictly comply with the safety and security rules laid down by JAA and EASA. Our executive aircraft service offers a wide range of flexible terms for governments, corporate and individual charter. A leading team of professionals will ensure that your journey requirements are met with the highest standards of passenger care, safety and security. The MD-83 airplane is powered by two Pratt & Whitney JT8D-219 aft-mounted turbofan engines and is designed to provide efficient operation and reliable transportation of passengers and cargo. Simplicity of design permits efficient operation with a crew of six: a captain, first officer and four CCM. An auxiliary power unit (APU) and an integral passenger forward stairway and aft stairway facilitates passenger loading, unloading and engine starting at airports equipped with minimal ground support equipment. External service points may be reached without use of ladders or stands and cargo may be manually loaded from the ground without special equipment, resulting in an approximate turnaround time of 45 minutes. The passenger cabin, interior furnishings, and equipment are designed to provide a high level of comfort and versatility in seating arrangements. This article documents a current event.Information may change rapidly as the event progresses.